Here’s a really nice recipe that will be a wonderful addition to your meal planning. 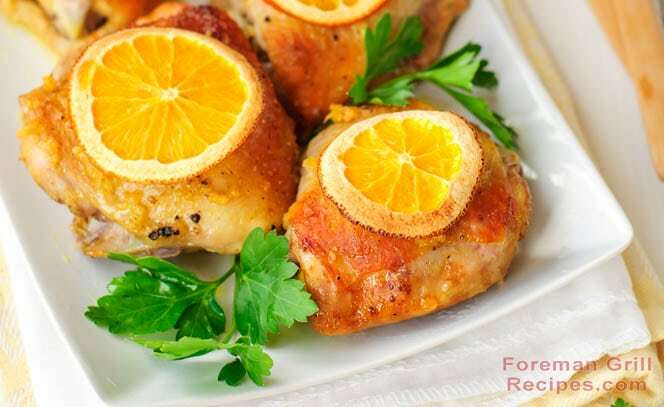 This easy grilled orange chicken recipe uses boneless, skinless chicken breasts and a few common ingredients – most notable frozen orange juice concentrate, to create a healthy, nutritious and delicious meal. As with most chicken recipes for a Foreman Grill, you’ll want to pound the chicken breasts to approximately 1/2″ thick. This does 2 things, ensures even cooking on the electric grill, and also helps to tenderize the meat. The easiest method for this is to simply place the chicken breasts between 2 pieces of wax paper, place on a wooden cutting board or kitchen counter, and use a meat mallet and pound them to a nice even thickness. This recipe works fantastic as a meal all its own. You can serve it over white rice or with some wild rice as a side dish and some fresh steamed or grilled vegetables. The dijon mustard in this recipe also really helps to accentuate the flavors of the orange. Throw on the oranges wedges for even more flavor flair. Place pounded chicken breasts in a shallow baking dish or ziplock bag. Add orange juice mustard, pepper and salt. Mix well and make sure the chicken is well coated. Let marinate in refrigerator for at least 15 minutes. If you can marinate longer, go for it! Preheat your George Foreman or other indoor grill for at least 5 minutes with the lid closed. Use high setting if you have it. Place chicken breasts on grill and close lid. Let grill for about 5 minutes and check for doneness. Make sure there is NO pink in the middle. Internal temperature should be 165 degrees.